RhinoPiping is a new plug-in, developed by NAVINN Software, to create piping networks in a 3D environment and forward information to people working in engineering offices, purchasing, subcontracting, manufacturing, assembly, and testing. Import a model into your 3D environment. Describe the standards and rules of conception. 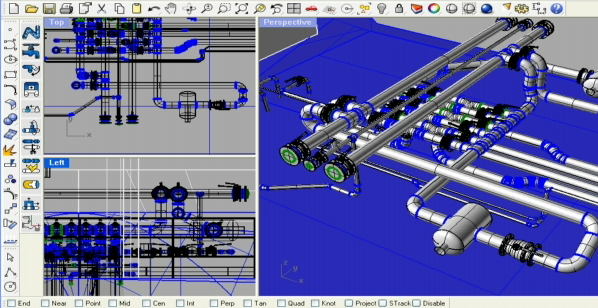 Model, modify, analyze, inform, show 3D piping networks. Edit your coordination drawings, your isometrics views, as well as your manufacturing drawings and your detailed part lists. Exchange your files with other PLM, CAD/CAM and CAE software packages. Innovations in the GUI innovations: meta-functions, decision support, automatic capitalization of acquired information. Unlimited editing: Modifications are unlimited to provide you with greater adaptability and a faster reaction to changes. Customization: RhinoPiping adapts itself to your way of working and to your needs. Small investment: No specific hardware requirements. Affordable price. Easy to use.